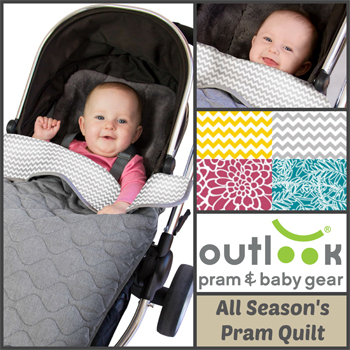 A dual purpose pram quilt designed to comfort your baby through summer and winter! With soft brushed 100% cotton flannel on the inside against baby's skin and a lightly padded chambray outer, this quilt cover alone is perfect for the warmer summer months. Double the warmth factor (TOG) by inserting the specially shaped quilt inner for when the weather gets chilly while you're out and about! Guaranteed to fit all prams and buggies, attach the quilt securely to your pram's frame or thread the harness system through the hidden loop and your cosy cover will never fall off under the wheels again. Baby's feet can tuck into the internal foot pocket or stay free for breezy kicking freedom! And still this Pram quilt will not fall off. Available in gorgeous prints and colours to coordinate with your other accessories, our pram quilt is easy to wash and care for. Team with an Outlook Cotton Pram Liner, Baby Head Snug with Bonus Liner or an Outlook Pure Wool Liner to complete the look.